Harmony, newly established women wear fashion label in Pakistan now introducing its latest spring summer lawn ready to wear collection 2015 for girls. The collection is titled as Harmony Pakistan Digital Prints Collection 2015 that is ready for sale at all Harmony stores in major cities of Pakistan like Karachi, Islamabad, Lahore and Faisalabad. You can also buy Harmony ready to wear summer dresses through official online store of Harmony Pakistan. Beautiful and elegant Pakistani dramas actress Mawra Hocane is the brand ambassador of Harmony Ready to Wear Digital Prints Collection 2015, she brilliantly presents this collection. All dresses are stitched very beautifully as per the latest demands of every young girl and woman. Mostly kurtas, short shirts, long suits and traditional shalwar kameez that are paired with tights, trousers or jeans. The price range is also very affordable of Harmony spring summer ready to wear collection 2015, starting from Pkr. 1700 (Pakistani rupees). 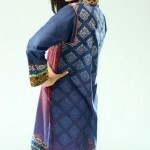 This is ready to wear printed plus embroidered collection for women. Mostly bright and natural colors are included in Harmony spring summer pret collection for women, like shiny blue, red, purple, majenda, ivory, burgundy, green, orange and yellow. All designs are manufactured in two colors option, and available as ready to wear in different standard sizes such as Small, Medium and Large. The brand introduced ready to wear range under these titles i.e. HORNBEAM, MYRTLE, JONQUILLE, MARIGOLD, ROSE, JUNIPER, VALERIAN, PERIWINKLE, GERANIUM, NIGHTSHADE, LAURESTINE, HORTENSIA, HAWTHORN, BELLFLOWER, PEONY, DAHLIA, DAISY, IVY, ARUM, ACACIA, BLUEBOTTLE, IRIS and ACANTHUS. Each dress in Harmony Pakistan summer collection is titled under the unique name that is the brainstorming behind the brand marketing this year. See below here Pakistani fashion brand Harmony Spring Summer Digital Prints Ready to Wear Collection 2015 for women. Check complete magazine catalogue of Harmony Pakistan.